Easy, right? I’m sure you don’t need it, but here’s another view. Gods save you if you actually get this right! 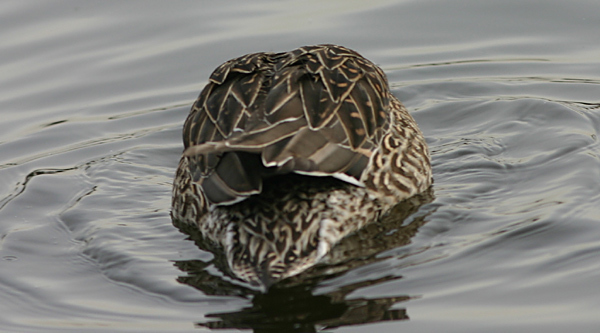 I vote female Northern Pintail. Great photos! Do we have any dissenting opinions? Long wings and nice arrowhead pattern. 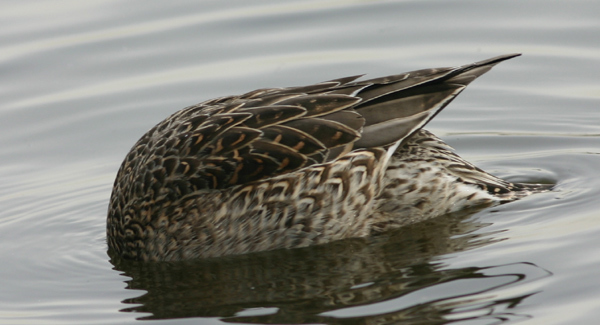 I’ll say White-cheeked Pintail. Nope, just kidding, I’ll go along with the crowd. Northern Pintail. Man, you three are good! Yep, that is a tough one. Not to be disrespectful, but I have more experience than all of you. I can see how you could interpret the feather design to be that of a pintail, but this bird is acyually a rare type of white-breasted northern woodpecker. It is an albino, this explains the white-tan tint to the feathers, and the reason that it is in the water: it is feeding off of chemical nutrients from the bottom to control it’s lack of pigments. This is a once in a lifetime bird, congratulations! For the beginners above me, keep trying to improve your knowledge, one day you might be experts.